that the cave had actually been cut in half by the railroad and that Dr. Gidley had explored just the southern sector. Immediately the opposite section was entered and just inside, the left ramus of the mandible of Euractus vitabilis, an extinct type of bear, was found. This was an indication that this portion of the cave had also served as a depository for many bones and so excavations were begun. In the course of several years work, two rooms, connected by a narrow passageway were discovered. The first is ten feet long by six feet wide and was excavated to a depth of three feet while the second room, which is slightly larger than the first, was excavated to a depth of four feet. The excavation itself was rather difficult since the dust raised in the small chamber made breathing and seeing difficult. Also, each shovelful of dirt had to be sifted since some of the bone fragments are only 1/8 of an inch in size. As a result, progress was slow but since each bucketful of dirt disclosed some new bones, the work was not too discouraging. 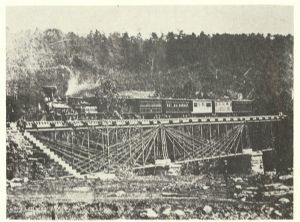 This is a Baltimore and Ohio train on the North Branch Bridge at North Branch, Maryland, about five miles east of Cumberland. It was constructed by Wendel Bollman after the original covered wooden span had been destroyed by the Confederate soldiers in 1861. The picture is from the collection of the late F. E. Rathbun, Superintendent of Schools of Garrett County. The picture is used with the permission of the Garrett County Historical Society.